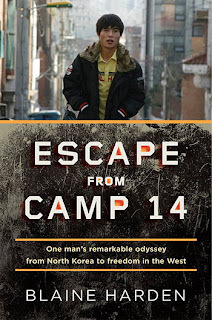 Escape from Camp 14 : One Man's Remarkable Odyssey from North Korea to Freedom in the West is not really a book that you read for fun. It isn't pretty and it isn't entertaining. It is, however, informative and impacting. It is the story of Shin Dong-Hyuk who escaped from a labor camp in North Korea. The amazing thing about his tale is that he is the only known person to have escaped from a North Korean labor camp, survived, and told anyone else about it. Viking Press (Penguin) offered me a chance to read this book and I jumped at it, being that my son is adopted from South Korea and I'm interested in the geography and politics between North and South Korea. I thought this would be a very powerful and engaging story and it was that. What I didn't count on was how quickly I would want to be done reading the book. It isn't a story that I could necessarily stomach lingering in for long. It is cruel, it is harsh and it is brutal. What is compelling about this story (well, there are several things . . . ) is that North Korea denies the existence of labor camps. They also deny the outside world access to their country in an attempt to uphold the decrepit conditions within their sad borders. They conveniently forget about things called "satellites" which have seen the camps and reported them to the outside world. (It is always amazing to me when a person or a country keeps repeating a lie and others feel that they cannot do anything about the subject being lied about because they must honor what is being told them. It's like we've lost the ability to fearlessly call a lie what it is so that it can be dealt with effectively. Instead of confronting the lie with the truth, we allow it to continue into something sick and mutated. By failing to speak and act on the truth we allow bad behaviors to continue. When this happens, lives are inevitably damaged at the very least, or destroyed at the very worst.) In the case of Shin Dong-Hyuk, I would say that his life has been damaged by the North Korean government; by all of the lies that they have told to foreign governments as well as to their own people. Escape from Camp 14 tells how North Korea selects families like Dong-Hyuk's and declare them traitors to the country for any variety of reasons. In the case of Dong-Hyuk's family, a relation of his had tried to escape from North Korea and was caught. That relative was declared a traitor and it condemned him to death. The rest of his family - up to three generations - were then to be imprisoned as traitors. In order to pay for the sin of being a traitor, you must work hard in a labor camp, for life. Dong-Hyuk was born into Camp 14 and never experienced freedom of any sort. He worked constantly, was fed little and was encouraged to spy on his family and "friends" and report anything suspicious to the guards. Think: Nazi Concentration camp from birth to death. That pretty much describes the life of a North Korean born and raised in a labor camp. Dong-Hyuk was perpetually hungry, always afraid of a beating, and never understood the love of a mother or father. It is a most depressing story. But it is true and that is what is so astounding about it. I very much appreciated Blaine Harden's manner in presenting Shin Dong-Hyuk's story. He explains early and often that you cannot verify facts out of North Korea. While he has heard Shin's story and has been able to compare it to that of others who have escaped North Korea, he cannot say whether or not the story is completely factual. (It is to be believed as far as anyone can discern, based on information which has made its way out of that country.) Harden's voice does not get in the way of Dong-Hyuk's and he is not trying to persuade his reader to act, think or believe in any particular way. I have to say that I was quite impressed by the piece of journalism which is Escape from Camp 14 . It is interesting, compelling, intriguing and heart breaking, all while being straight forward and easy to comprehend. He doesn't try to impress you and he doesn't even try to make you like Shin. He's just reporting on a story and giving you all the facts that he has. I liked this very much. All in all, despite the harsh content within these pages, I have to highly recommend it. North Korea is an astounding country. Should it's borders ever be opened, I can safely say that the light of the Gospel of Jesus Christ is the only thing that is going to make North Koreans truly free. There is so much garbage and baggage involved in daily life that it will take a true Savior to relieve them of their great burdens and give them rest. This sounds interesting, well-written, and heart wrenching. I've been interested in people who survive totalitarian regimes since I studied 20th century European history waaaaay back when I went to college the very first time. However, I'm not sure right now is the time for me to invest so much emotion and brain power in a book. ;-). Thanks for such a thoughtful review, as always. This one definitely sounds interesting. I like your thoughts on the role of the author, which is a topic I have considered more as of late. It is not easy to tell a story without getting in the way or making it about the author, while still making the story compelling. Good review. I may have to put this one on my list. Long Road Home: Testimony of a North Korean Camp Survivor (2009) by Suk-Young Kim is a similar book written by a former officer in North Korea who escaped from a labor camp. I've read a synopsis of Camp 14 and Long Road Home differs in the perspective that the prisoner has, based on his previous experience as a high ranking officer. It's available at our local public library. A friend just loaned me Long Road Home. Wow, this sounds awful (situation, not book), but worth the knowledge of truth. @Taia - I kept seeing Long Road Home pop up whenever I'd look up info on Escape from Camp 14. I think I've had my fill for a bit, but I would like to read that in the future. I suspect that much of Shin Dong-Hyuk's story was compared specifically against the testimony of the guy in Long Road Home. All we can do is compare stories looking for commonalities. Which is sad. This sounds horrifying. . .but worth reading. How totally sad. Hopefully stories like these coming to light will help make inroads into officials checking into things like this, but ultimately, as you said, the only real hope is the gospel. And we tend to think that once someone escapes from a horrid situation, most of their troubles are over, but, wow, I never thought about all the adjustments, deep-seated attitudes, and habits and warped views he would have to deal with afterward. Wow! I hope more people read stuff like this, so that truth can be established. I'm adding this book, but I can't say I'm giddy about reading it. I have this waiting for me at the library...just not sure if I have the guts to read it. Also bought recently Nothing to Envy by Barbara Demick...I'm on a NKorea reading tangent.